Finally, after 13 years, I have found myself with enough time on my hands to begin documenting the incredible story of the handing back of the Dagu Bell in book form. Discovered in a greenhouse in Victoria Park, the significance of the bell remained unknown until a curious twist of fate linked it to a long lost relative. 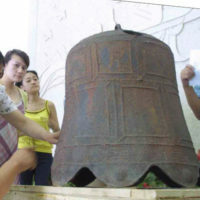 Read more about the story of the Dagu Bell and its discovery on this page. Everyone has a bookie (wookie!) in them – and this is the time for the bell story to be tolled.